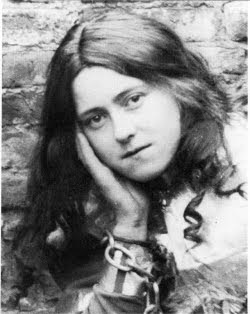 Thérèse of Lisieux often gets a bad rap for being one of the most sentimental and girlish of saints. And the syrupy sweetness of much of the Catholic devotion for "the Little Flower" no doubt contributes to this impression. However, as I've tried to show in this series there is a toughness to Thérèse's spirituality. The Little Way is no easy or sentimental journey. It'll turn your life upside down if you let it. It's messing with mine for sure. But beyond the Little Way, Thérèse is also of interest to us for another reason, something that also pushes against the stereotype that she is an overly sentimental saint. We are speaking here of Thérèse's dark night of the soul. You'll recall that Thérèse was asked to write Manuscripts B and C of Story of a Soul--the spiritual heart of her memoir--because she was dying. In 1896 on the evening before Good Friday, and this timing seems apt given what was to follow, Thérèse awoke in the night to find her mouth filled with fluid. It was too dark to know what it was, but the morning light confirmed her suspicions that it was blood. She had contracted tuberculosis. Thus began her slow, protracted, and painful walk toward death. During this time Thérèse experienced a profound spiritual darkness that, as best we can tell, never resolved itself. Some of this darkness finds its way into Story of a Soul and some of it was captured in things she shared with sisters and novices at Carmel. [God] permitted my soul to be invaded by the thickest darkness, and that the thought of heaven, up until then so sweet to me, be no longer but the cause of struggle and torment. The trial was to last not a few days or a few weeks, it was not to be extinguished until the hour set by God Himself and this hour has not yet come. I would like to be able to express what I feel, but alas! I believe this is impossible. One would have to travel through this dark tunnel to understand its darkness. Thérèse says that she was plunged into a darkness "far from all suns." Looking for heaven she says, a "fog surrounds me and becomes more dense; it penetrates my soul and envelops it in such a way that it is impossible to discover within it the sweet image of my Fatherland; everything has disappeared!" I must appear to you as a soul filled with consolations and one for whom the veil of faith is almost torn aside; and yet it is no longer a veil for me, it is a wall which reaches right up to the heavens and covers the starry firmament. When I sing of the happiness of heaven and of the eternal possession of God I feel no joy in this, for I sing simply what I WANT TO BELIEVE. It is true that at times a very small ray of the sun comes to illumine my darkness, and then the trial ceases for an instant, but afterward the memory of this ray, instead of causing me joy, make my darkness even more dense. What we find here is one of the most extreme dark nights of the soul from the lives of the saints. And it's a startling and unexpected discovery given the sweet sentimentality associated with "the Little Flower." But there is nothing sweet or sentimental about Thérèse's faith struggles in the face of death. Again, as best biographers can tell, this dark night lasted to the very end. In fact, as discussed by Tomáš Halík in his book Patience with God, a recent biographer of Thérèse's, Thomas Nevin, argues that Thérèse died without faith. I no longer have any great desires except that of loving to the point of dying in love. The Darkness of my exile here. If you only knew what darkness I am plunged into...Everything has disappeared on me, and I am left with love alone. Your child, however, O Lord, has understood Your divine light, and she begs pardon for her brothers. She is resigned to eat the bread of sorrow as long as You desire it; she does not wish to rise up from this table filled with bitterness at which poor sinners are eating until the day set by You. Can she not say in her name and in the name of her brothers, "Have pity on us, O Lord, for we are poor sinners!" Oh! Lord, send us away justified. May all those who were not enlightened by the bright flame of faith one day see it shine. O Jesus! if it is needful that the table soiled by them be purified by a soul who loves You, then I desire to eat this bread of trial at this table until it pleases You to bring me into Your bright Kingdom. I'm not sure I can track, with my rationalistic mind, the mystical flight Thérèse is taking here in this passage. But the general idea is clear enough. Thérèse finds herself at the bitter table of unbelief in solidarity with non-believers. And there she intercedes for her brothers, calling out for their justification and salvation, and offers her own life of doubt as a ransom for theirs. In all this we see Thérèse sacrificing faith for love. Her last act isn't faith. It's love. As she says, "I am left with love alone." Faith is irrelevant (or gone missing). All she wants to do is love "to the point of dying in love." At the gates of death, did Thérèse perhaps experience something of that final state of which St. Paul writes in his letter to the Corinthians--that ultimate state when everything will come to nothing? Perhaps his words also apply to faith and hope, for they will have "fulfilled their task" of accompanying us in the valley of shadow of this ambiguous world--but love will endure? Was the hell of Thérèse's suffering and inner darkness paradoxically the entrance to a "heaven" where just one of the three divine virtues survives? Man does not fall into boundless darkness but returns home, into the full light of true: faith has already fulfilled its pilgrim task; only love reigns here and now. This will not cancel faith but fulfill it; if faith "dies," it does so only by being dissolved in love--but even this death may be experienced as a passage through the dark chasm of nothingness. Christian faith--unlike "natural religiosity" and happy-go-lucky religiosity--is resurrected faith, faith that has to die on the cross, be buried, and rise again--in a new form. This faith is a process--and it is possible for people to find themselves at different phases of this process at different moments of their lives. I have often heard the ironic statement that faith is simply "a crutch" to help those of us who are weak and lame, whereas the strong have no need of it. It is not "a crutch," but it might be compared to a pilgrim's staff that assists us on our journey through life. Maybe when someone is just about to cross the threshold of home, when the staff won't be needed anymore, it falls from his hands; it's not surprising if he loses his balance for a moment. "Seen from the other side"--from the viewpoint we can only experience here as an assurance, as hope--beyond that threshold, at the moment we lose all supports and certainties, there awaits us an embrace of love that will not let us fall into emptiness. Faith is converted into love--sometimes not until the last gate, sometimes earlier, perhaps. Where faith dies, love continues to burn so darkness cannot have the final victory. Is it our love or His? It's a pointless question. There is only love. Beyond faith and hope there is only love. Thérèse, I think, would agree. The fact that love still exists in the darkest nights of the soul is reason enough for me to believe. As a woman, it profoundly bothers me that "sentimental and girlish" is considered high insult. IMO, the contribution of the church mothers is neglected and the church is poor for marginalizing and putting down half of God's image. I can recount experiencing dark nights of the soul three times, each a different experience. While I shudder at the thought of going through any of them again, on this side of them, I wouldn't trade any of them in for the world. The work they accomplished in my life was worth it. In fact, Christmas has taken a back seat to the winter solstice for me; on this longest night I give rememberence to my "nights" and let myself feel agony and grief along with gratitude and love with a deep sense of sacredness. I agree, it's a superficial response and reaction to, upon inspection, one of the most profound spiritual teachers of the church. For me, I bring up the issue because it has less to do with "high insult" than the style of Story of a Soul which, as many people have recounted, can be hard to get through. Even for women. For example, Dorthoy Day felt this way about Thérèse upon first encounter. So, by bringing up the issue of style and first impressions I hope to head those reactions off at the pass to get people to look to the substance of what Thérèse is teaching. Excellent post, Dr. Beck. I hope to be able to keep Thérèse's thoughts, and especially Halík's brief interpretation of Thérèse and the Christian faith lodged in my memory. I recently learned of Halík through another blog, and I hope to read some of his books in the near future. Is 'Patience with God' a good starting point? Awesome. You rocked my vote for "love is the greatest." Therese's dark night of the soul rings deeply true to me. I keep thinking about Liam's priorities in life: "Create something, learn something, and show love...each day." A comment about Thérèse's picture in this post. If you look closely you might notice a chain around her wrist and also wonder why a cloistered nun had her hair down. This was a picture of Thérèse dressed for a play she was doing for her sisters. She's in costume dressed as one of her heroes, Joan of Arc. To one going through a dark night, there seems no hope of it ever ending. Perhaps if Therese had lived, she, too, would have come through it. But your coming out the other side of it, not once, not twice, but three times is an encouragement that it does eventually end, at least for some, with insights in hindsight. I know sometimes it's hard to express, but I'd be interested in hearing more about it from you. It seems to me a Gethsemane experience is not an option, and eventually everyone who follows Christ has to experience it at least once. For some, it's the ultimate definition of their faith, which those in certitude hedge and dismiss, perhaps to try to prevent their own. "The greaetest of these is love" Love trumps even faith and hope. Especially when faith is defined in terms of right viewpoints, and hope in terms of certitude. Love is the only one of that trifecta that can get in the trenches alongside those who are hurting without doing more damage. That's one of the things that interests me about this line of thinking. In a certain sense, and perhaps most of the time, faith interferes with love. Thus, to get to love faith has to be relinquished. Faith is an early stage of love that we grow out of. "Love is the only one of that trifecta that can get in the trenches alongside those who are hurting without doing more damage." 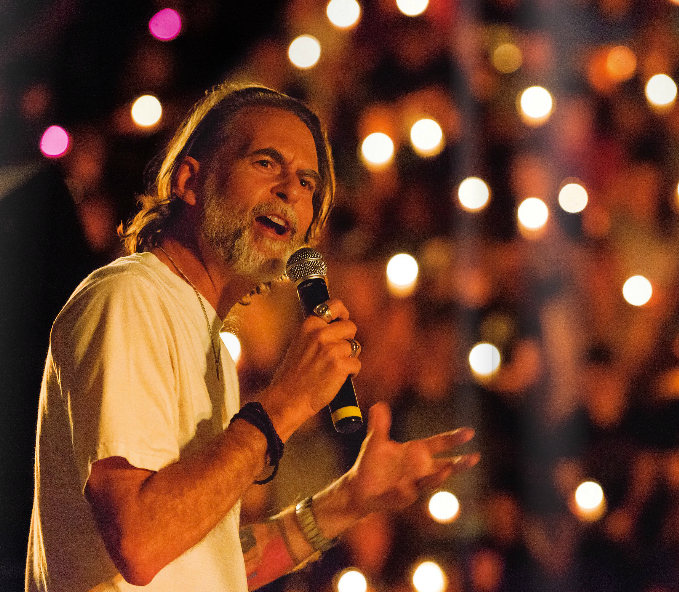 "Faith is an early stage of love that we grow out of." In 'Unclean' you talked about a fusion of love for God with love for people, which leads to a privileging of mercy over sacrifice. If we mean by "faith" a right belief in and obedience to God, then clinging to that faith at the exclusion of loving people, with a merciful, compassionate, Christ-like love is, I think what, the Apostle Paul was talking about in 1 Cor. 13. Yes, that's the idea I'm talking about. Faith can be so clear-cut to someone who is professing it. But love is always so messy, because life is messy. I wonder if that's why faith is always trying to clean up the mess and get it out of sight. Richard, when you note that faith might need to be relinquished to get to love, I would refine this a bit further and say that our basis or ground of faith may need to be relinquished. And I would add that when such relinquishing is immovable, one is probably engaged in certainty rather than faith. Faith is flexible, certainty is not.... Still your point is well taken. Is that from "Leaf, By Niggle"? It is near the very end of Return of the King, after Sam parts with Frodo and returns to his home. It's from the end of "Return of the King" as Frodo is sailing into the west. Sorry Rob, didn't see that you had answered. Jesus saw the Father, He knew the Father, He came from the Father, He was going to return to the Father. Can you have faith in what you have come to know as a given? I feel for you Patricia...and at the same time I feel hopeful for you. I hope one day to see the gold being wrought as we speak. Loreena Mckennet put to song St John of the Cross's poem from which this phrase is coined. I found it to be a salve in my experience. I would also point out this to feed your context of this experience you're going through: Kierkegaard's Leap of Faith. Imagine standing on the cliff's very edge. Below your toes is nothing but impenetrable absence of light. Even the dark of night has more light. Behind you is the budding promise of progress, the epoch of mankind's salvation. The problem is, you know in your bones that those lighted streets are artificially lit. Somehow, you know that the real light is below your toes. You are now standing on Kierkegaard's edge where he felt the decision of his life: either he leaps into the abyss, or he walks back to the well lit streets. Either way he will be exercising his human capacity of faith. Kierkegaard lept into the abyss. It was there he saw the real light. Because he wanted real light, his faith took him into the abyss instead of the town square. To let faith be defined as believing without evidence is absolutely mistaken. The word faith is merely the noun form for the experience of believing. Some time today you'll drive your car somewhere away from home. If you didn't BELIEVE or HAVE FAITH (interchangeable) that the prospect of your returning home safely was CREDIBLE, you wouldn't drive your car. This means that any crisis of faith is an issue of credibility on behalf of the underlying ground of your faith; it's not a result of a flabby faith muscle. A credibility issue is one very different than a flabby muscle issue. Typically though, crisis of faith get treated like you have flabby muscles. Interestingly, this little thread here is converging on my Slavery to Death series. I bet people can see the connections. Basically, when faith is motivated by a fear of death god becomes an idol, an existential fetish and charm we need to possess and protect against Others. To let go of that idol is to undergo the dark night, the death of "faith." But faith in something that wasn't really God in the first place., which is, I think, your point here. Rather, this god was simply my fear dressed up in religious garb. This, I think, is what William Stringfellow was after when he said that the idol behind all idols is (the fear of) death. But letting go of idol worship is a fearful thing, for it kicks the props out from everything the culture told me made my life meaningful and significant. Which is why perfect love must cast out fear. "We are all animals who are going to die. We are all self-conscious of this fact, which makes us unique in the animal world. There is no way out of our paradoxical nature. Neurosis is normal; guilt is inevitable – it oozes from the unlived in us. Without repression, we couldn’t function or act decisively. The only question is, how do we best live with neurosis. Some people narrow down their symbolic thinking, they live inside themselves, trapped by fear. They fend off despair. The alternative to despair is some level of self-worth. To experience this is an illusion, but a necessary one. To experience this we must needs have a hero system. A sense of the ideal me. Most find this in status, in money, in goods, in romantic love, in virility… We carve out a place in nature – a palace, a dynasty, a cathedral… In this respect, we are all of us religious. But we subscribe to a religion of one. Our isolation both terrifies and comforts us. Our character is our credo. Real self-knowledge becomes the greatest threat to our sanity. We meet ourselves a thousand times on the journey through life. This is normality – the normality that has stripped this world like locusts. You are different; you are an 'artist'. You don’t narrow down into yourself, you open yourself up to symbolically embrace the whole world. You repress too little; you perceive too much. You are one of the courageous ones. But ultimately, in the face of your death, you are confronted by your animal finiteness. You are not God. You can’t save everyone. This is perhaps what you call the dark night of your soul. The only way forward, the only way to manage your neurosis in extremis, is to yield. You must transcend yourself. Only by dying to yourself can you live. Only by admitting the full flood of despair can you find the truth. You must be born again, not as a god this time, but as a woman – a woman who defecates and bleeds and is going to die. This takes men of granite and makes them weep. My therapy cannot help you – this is what you have taught me, Therese. My own hero culture is doomed to failure, as is yours. It has got me though life with some success, but it cannot get me through death. Psychology must bow to theology. Only in relation to the infinite can we refashion our links to others; lose our sense of separation; find love. But this is not a theology of books - only in relation to others can we relate to ourselves. Humans are the sole mediators of meaning. And yet no human can bear this burden of godhood. Either we over-emphasise the animal, trivialise each other into flesh and carnal appetites, or we over-emphasise the symbolic, compare each other with the perfect and sink to criticism and fault-finding. I think you're very right. And I think your description here might be the most elegant I've read; I don't think you can make this any more concise with the same amount of descriptive power. My first dark night found eventual relief through Becker's Denial of Death. The revelation I received pointed out that theology was my God. I still remember that prayer where I opened to that realization and uttered "God you are free to be who or whatever you are; Christ or not Christ.... 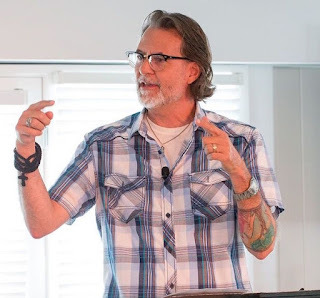 I would rather know you than contain you...." One thing that was most remarkable to me about that experience was how much dread and fear I felt in that moment when I felt that prayer "lining up for its launch" and before I uttered it. I felt first hand, Kierkegaard's leap of faith into The Abyss. I was changed forever and I never looked back. I think that giving away love can feel, on the surface, like a death or loss of self, if one has a sense of love being a possession, or a commodity. In that sense, the greatest act of faith is to step out and extend love, to give a part of oneself. Frankly, it is painful at times to love. We tend to get attached to the people we love, and it is hard when we lose them in one way or another. It is hard to love and not be loved in return. What if I reach the end of love? These are the "earthy" fears that get in the way of loving through faith in God's eternal, limitless love and goodness. Mortality, strangely (or maybe not so strangely), hasn't bothered me (even potential physical pain and suffering leading up to death) since my son's death. I think the fear of loss and little "deaths" in the day to day has been a very real ongoing challenge for me to continually confront. The Slavery to Death series was excellent. I look forward to the book. To Dr. Beck - man!!! Love seems to be the gold which validates faith (path of faith). It's as if this is saying legitimate faith/hope are in series with love, or subsets of love. If the faith is based on a false premise or foundation, maybe its path never resolves in love. Another way to ask this - is it possible that only those who walk a valid path of of faith and hope actually reach the opportunity to experience a darkness of soul - in order to complete their development/fulfillment of love? Thank you for answering, Mike. For me, it has been a year of realizations, that constructions that had been sold to me as "love" and "faith" were shallow at best, false at worst, in the name Christianity, church, piety, family, etc. I love what you said about theology had become your god, and you realized it. At Christmas, I was given a book by a well-meaning person titled "Christian Atheist" that's chock full of those same old constructs. It all seems so "boxed lunch theology" to me. Sort of like Bill Engvall saying, "here's your sign." And yet I understand why people feel so threatened when their boxed lunch faith is called out as such. It terrifies them. How dare anyone reject their constructs that they offer in the name of Biblical Christianity, because it's all they know to be true, and they can't imagine the depths beyond the darkness. But then, they may be avoiding their own dark night for fear of losing faith as they know it, and can't imagine faith surviving that unknown leap. A credibility issue vs. a flabby muscle issue. Would that mean a matter of what your faith is in vs. lack of faith? Like putting faith in a theological construct, and fearing to walk away from it because it seems too much like no faith at all to do so. When it reality, it's faith that drives you to walk away and find Christ more real than the theological constructions man-made to define Him. I hope I'm making sense. "But after her dark night Thérèse understood, intimately so, what non-believers were experiencing. She found herself in loving solidarity with these non-believers, forced through the grace of God to eat at the shared table of non-belief." What a beautiful and profound image. Too bad it is not taught in Sunday School. If it was there wouldn't be so many Christians that equate unbelief with wickedness and rebellion. Patience with God is the only book of his I've read. But it's very good. Yeah - love is really messy, and chaotic, and counter-intuitive. So much so, many times these days, I've resigned to the reality of how much I fail at love. Oh, and you've totally convinced me to read Therese. I'm well into my second reading of Story of a Soul since you first mentioned it (once on Kindle, then had to order the book), and I'm fascinated. I wonder how much of the "oddity" is actually the depth of her introversion (or resultant personality traits), even as a child? She should be the patron saint of the introverted!! Great post Richard. It seems to me that her experience was not a loss of faith, but a loss of certainty. Her conviction to continue to love is the profoundest expression of her enduring faith even in the face of the loss of the certainty which once held her so tight and fuelled her to action. I am reminded of the end of John's gospel: "Blessed are those who have not seen and yet believe." It strikes me that Therese was forced to maintain her faith in God as love in spite of her loss of sight (figuratively speaking). This would seem to gel well with your recent post on Biblicism. I could be wrong of course. The classic view is that idolatry names an issue of fidelity to the one true God. But here, we're talking more about a pathway into a fuller, better, healthier, more authentic, etc., experience of being human aren't we? All I'm getting at when I distinguish between flabby muscle and credibility problem, is the experience of being told "you just need more faith"; as if all you need to do is scrunch your face and sphincter tighter to get more of it. But faith understood correctly, when one experiences its lack it's mostly because you see a possible basis of believing not having sufficient credibility. For instance, if your returning safely from a car trip to the store was not a credible notion, you won't get in your car. In other words, you don't believe that you will indeed return safely. Until you do believe, you won't get into your car. Only when your safe return is credible to you, will you have the faith to drive to the store. God knows we all fail at love, and we're all a mess. But that doesn't make you any less valued. You are, therefore you matter. I forget who said (something like) "success is trying again more times that you fail" or "getting up more times than you fall." ..... What I really like about Veggie Tales (watching with my 5 year old) is the end bit where Larry (or is it Bob) says "Always remember, God made you special and he loves you very much! " My hope and prayer is that that message sticks with my kids thoughout their lives and somehow we can share that with others ... as sometimes we all need help getting back up again.... .....your post got me thinking about that. Wow, this so describes where I am, but I think I'm beginning to turn the corner towards renewal. Thanks, again, for the encouragement, Dr. Beck!